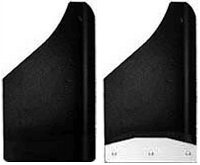 This Mud Flap for Ford F-250/350 is a Drill-less Mudflap, approximately 12 inches wide by 3/8 inch thick; designed to hang approximately 12 inches below the fender-well. Application: REAR of all 1999 thru 2007 models of full size FORD trucks with stock tires and stock suspension. This Ford F250/F350 Mudflap is a Drill-less Mudflap, approximately 12 inches wide by 3/8 inch thick; designed to hang approximately 14 inches below the fender-well. Application: REAR of all 1999 thru 2007 models of full size FORD trucks with stock tires and stock suspension looking for extra protection of a towable. Serviceability: Mudflap hangs lower to protect your towable as well as your truck. 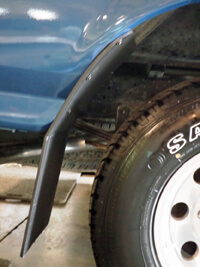 Mudflap is pre-drilled and requires no drilling of additional holes in your truck. Allows for easy & precise alignment, and drill-less installation.